Tiger is a free, open source collections of shell scripts for security audit and host intrusion detection, for Unix-like systems such as Linux. It’s a security checker written entirely in shell language and employs various POSIX tools in the backend. It’s major purpose is to check the system configuration and status. It’s very extensible than the other security tools, and has a good configuration file. It scans system configuration files, file systems, and user configuration files for possible security problems and reports them. 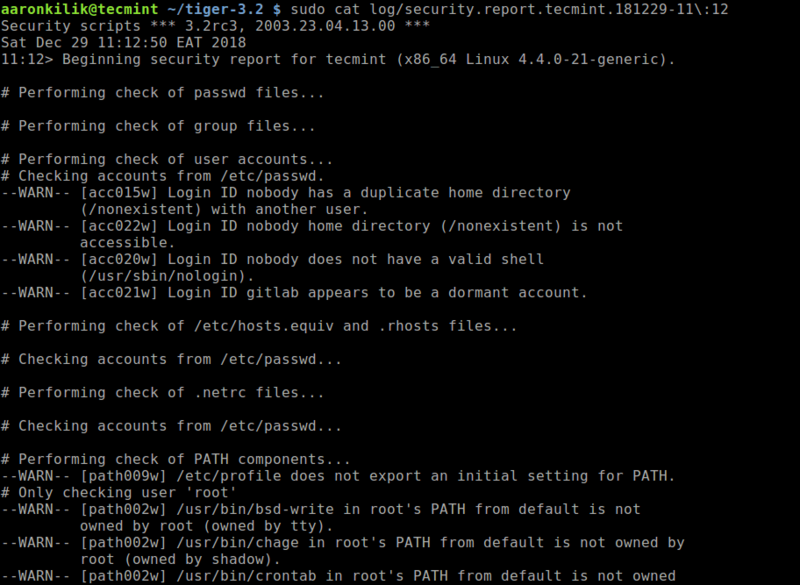 In this article, we will show how to install and use Tiger security checker with basic examples in Linux. On Debian and its derivatives such Ubuntu and Linux Mint, you can easily install Tiger security tool from the default repositories using package manger as shown. On other Linux distributions, you can download the latest source (the current stable release is 3.2.3, at the time of writing) and run it straight away from the terminal as as root or use the sudo command to gain root privileges. Security report is in `log//security.report.tecmint.181229-11:12'. You can view the contents of the security report file using cat command. If you just want more information on a specific security message, run the tigexp (TIGer EXPlain) command and provide the msgid as an argument, where “msgid” is the text inside the  associated with each message. --WARN-- [acc015w] Login ID nobody has a duplicate home directory (/nonexistent) with another user. --WARN-- [path009w] /etc/profile does not export an initial setting for PATH. If you want to insert the explanations (more information on a particular message generated by tiger) in the report, you can either run tiger with the -E flag. 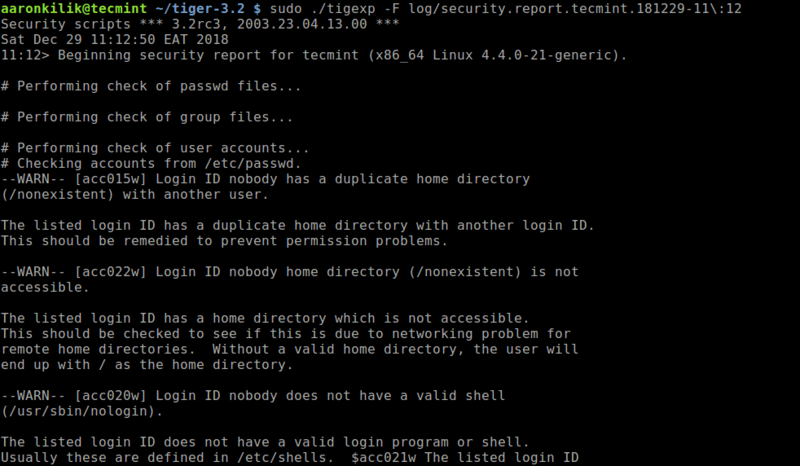 Tiger is a set of scripts that scan a Unix-like system looking for security problems – it’s a security checker. 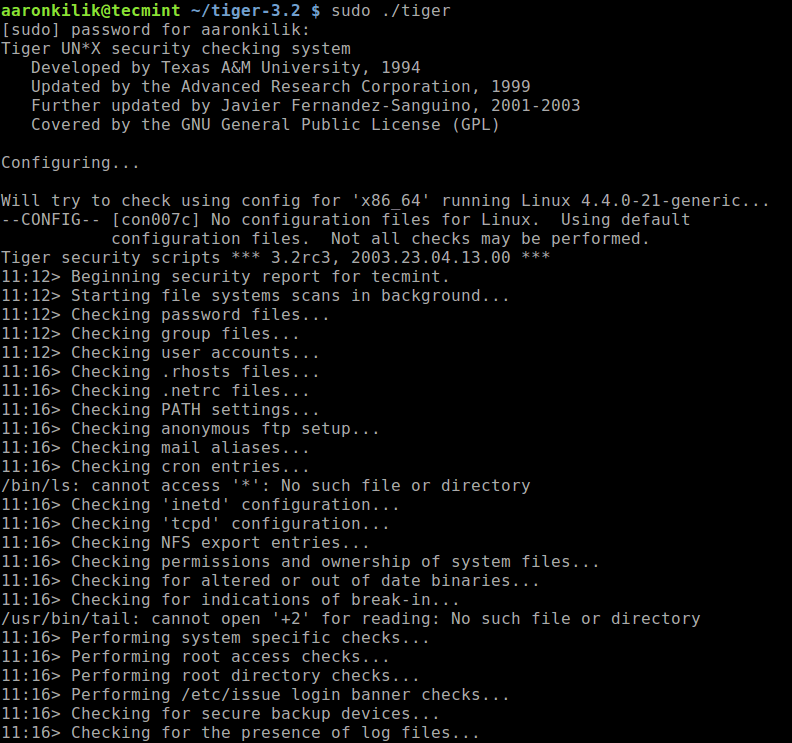 In this article, we have shown how to install and use Tiger in Linux. Use the feedback form to ask questions or share your thoughts about this tool.